CONTEST OF IDEAS. 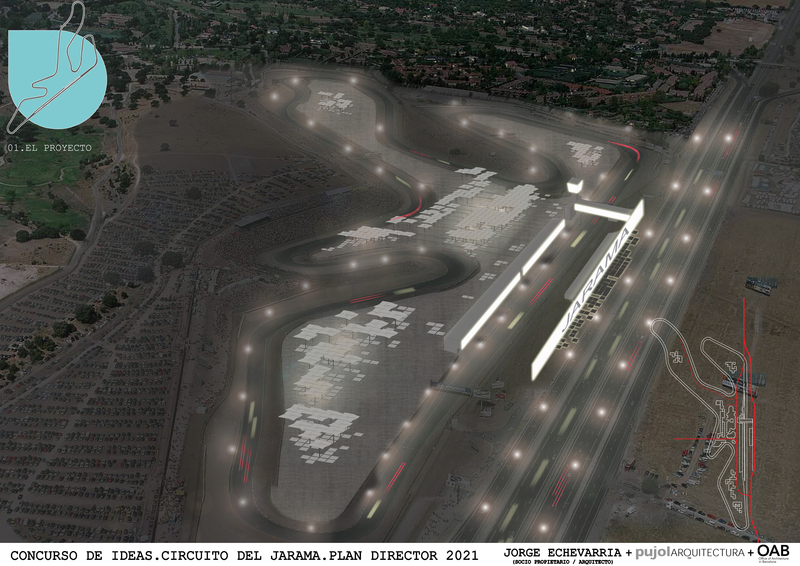 PLAN DIRECTOR 2021 Jarama CIRCUIT. 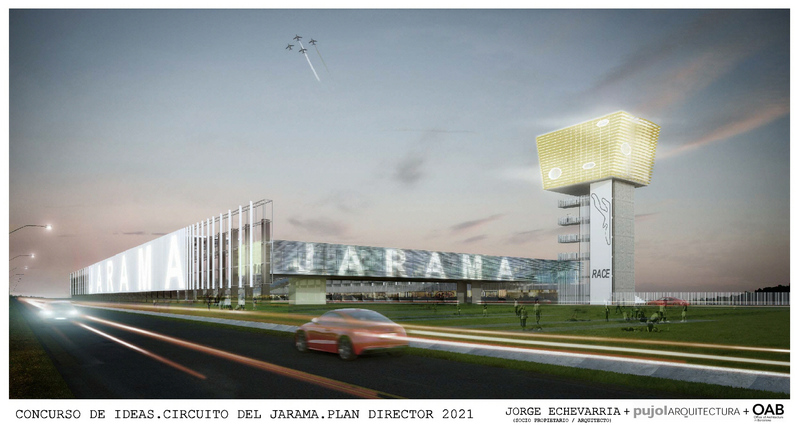 The team of this proposal is coordinated by Jorge Echevarria Mendicuti, Architect and member of R.A.C.E. in collaboration with Pujol Arquitectos and OAB. Jorge Echevarria Mendicuti. Architect. Sport Architecture Specialist. Pujol Architecture. Joaquín Pujol Simon. Architect. National Award in Sports Architecture 2001. Winner of the aquatic center project for the Olympics in Rio de Janeiro 2016. Brazil. OAB. Carlos Ferrater Lambarri. Architect. Spanish National Architecture Prize in 2009. Professor of architectural projects of the Technical University of Catalonia in the ETSAB and holder of the White Chair. 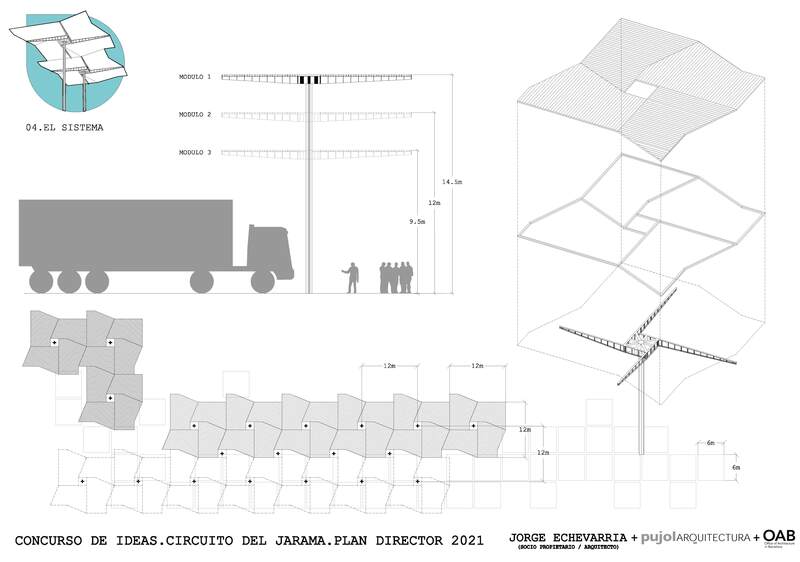 Prize of the City of Madrid and Barcelona City Architecture. THE PLAN R.A.C.E. 2021. 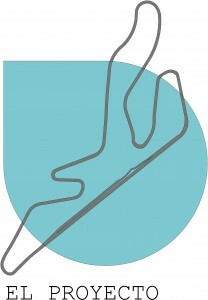 Jarama CIRCUIT. The Master Plan R.A.C.E. 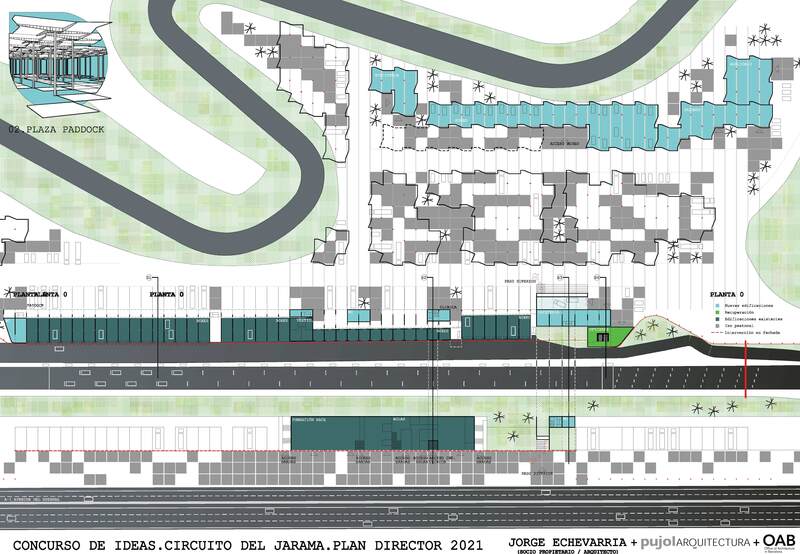 is a comprehensive transformation of existing facilities at the Jarama circuit, specifically in the paddock, giving the circuit a new building for the Foundation, that brings together commercial and recreational activities. It will pay special attention to the unique elements of the circuit: facades of boxes and control tower these items being very important in the new image that we intend to create.. The Master Plan proposes a building which integrates all intended uses: Foundation, school, library, office and restaurant. It will consist of separate volumes, but interconnected by a common central open space. To shape this transformation R.A.C.E. called the competition for the develoment of new the image and the definition of the control tower and annex office building architecture.. 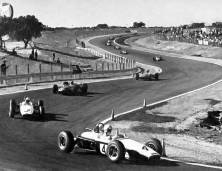 The Jarama Circuit was built in 1967 and to date has hosted numerous sporting events and various activities. In recent years, the image of the circuit has steadily deteriorated especially due to the uncertainty of future use.. Once doubts have been dispelled, the Circuit needs to renew and dignify its image and performances, so that it newly becomes an international reference in motorsports..
Certain elements of the configuration are still landmarks of reference for citizens, especially the control tower indicating next arrival at the Capital. The Jarama Circuit is one of the oldest circuits in Spain.. Having 3.850 meters of track, the Circuit's layout is a real challenge for the fastest. with roller-coaster kind ups and downs . 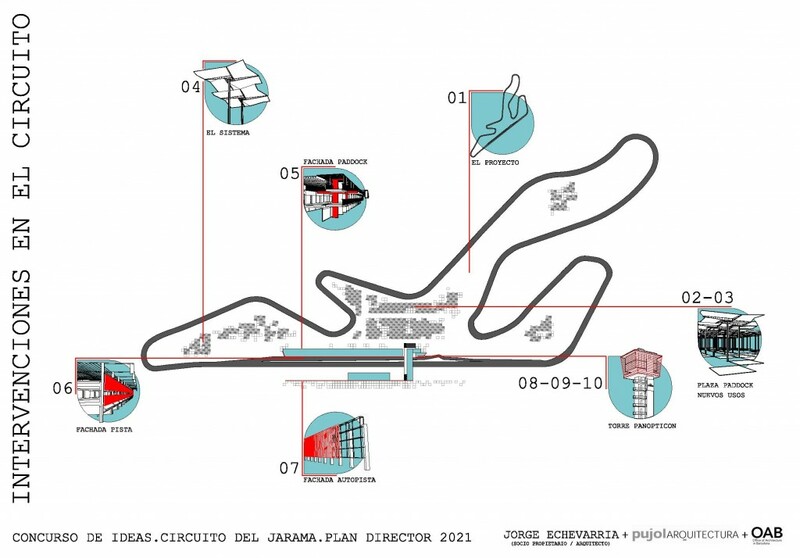 Unfortunatelly, Jarama is the only circuit in the capital of Spain, andits state is not entirely good according to present Motorsport standards: lack of escape routes and other technical features are not in place.. The Dutch engineer Hugenholtz drafted this track project whose construction was led by a Spanish, engineer, Sandro Ricci , being the architects Rodríguez Riveiro and Dominguez Aguado, who were entrusted the work of construction of the grandstands and the pits. 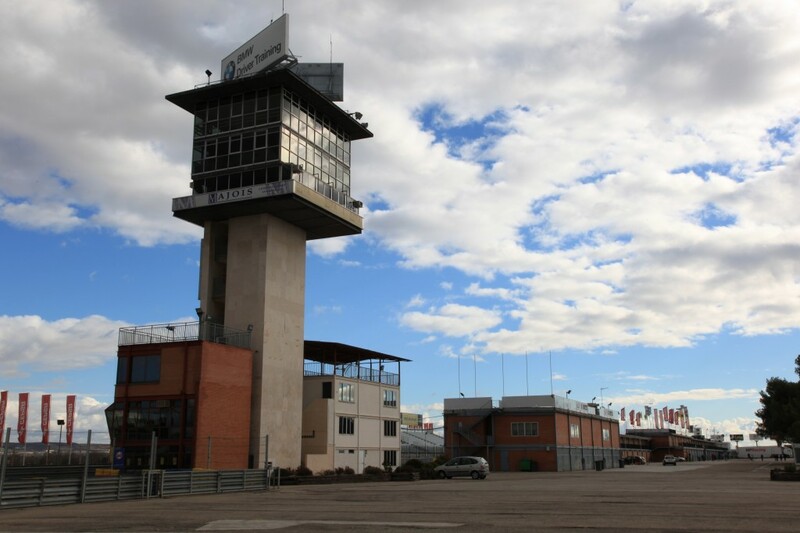 No doubt that the Jarama circuit is now part of the legend of Motorsports, not in vain, its track has hosted competitions of bykes, cars and even trucks of all types, including the FORMULA 1 Spanish Grand Prix, from 1977 to 1981, ..
Main straight and Finish Line, annex buildings Area. General Construction, access and specific matters. The project is based on the creation of organic growth modules, which may be enlarged to suit the variable needs of the Circuit, while creating an attractive image by means of a gradual economic solution. This working method allows us to tackle the makeover of the Circuit in a staggered and versatile manner, from less relevant to most important interventions. The pavement and garden areas circuit follow the same system, being carried out with modules 6×6 m, that would begin from the accesses to the Circuit and would orderly progress to every corner in a system of coordinated growth. 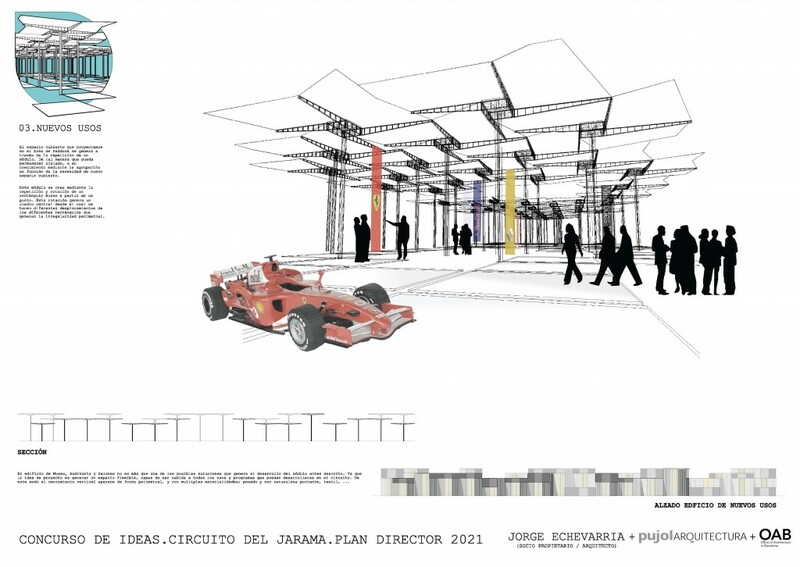 A "golden proportions module" in the Paddock area will allow, by repetition and rotation, the generation of covered spaces, open or closed, isolated, landscaped or paved to accommodate the proposed uses in the program. Interventions in the planes of the facades can be executed by modules, until completing the whole enclosure of the Circuit and Circuit and the Track; like a skin that starts from the pits or the grandstands and extends along its entire length. This same solution was proposed as a system for the embellishment of the access to the circuit and for concealing other elements to address their final disposal. The re-design of the iconic Tower is the first landmark to deal with, together with the administrative building and the ​​restoration area, to be completed afterwards with the gateway mode horizontal tower . We have to mention, that not assigning a numerical value to the actions, any of them can be undertaken at the most convenient point in time.